Welcome to my blog! This shale blog is meant for people interested in keeping up on the latest shale news across the USA & Canada. With higher oil and natural gas prices, discovering have been on fire. The Eagle Ford Shale, Haynesville Shale, Bakken Shale, Niobrara Shale, and the Marcellus Shale have really produced giant wells and the interest keeps coming. Mineral rights leases are doing incredible! www.oilshalegas.com has researched the following shale fields in the USA & Canada. Click below to learn more. Utica Shale News - Magnum Hunter Resources Corporation (NYSE: MHR) provides an update on the Utica Shale located in Noble County, Ohio. Magnum Hunter Resources Corporation (NYSE: MHR) announced today that its wholly-owned subsidiary, Triad Hunter, LLC ("Triad Hunter"), has closed on the acquisition of leasehold mineral interests located predominately in Noble County, Ohio (the "Utica Acreage") from an undisclosed seller for a total purchase price of $24.8 million. The Utica Acreage consists of approximately 15,558 gross (12,186 net) acres predominately located in Noble County, Ohio. The net price paid per acre for this acquisition was $2,037. The majority of the leasehold acreage acquired in this transaction is held by shallower production. The purchase includes all depths of 300 feet below the top of the Queenston Formation down to all further depths. There is no associated shallow production included with this acquisition. There is a possibility of a second closing on another block of similar acreage that may occur on or before April 16, 2012, assuming the Seller can satisfy certain title deficiency requirements. The Utica Acreage is in close proximity to Triad Hunter's existing acreage position in Washington and Noble Counties, Ohio, and now provides Triad Hunter approximately 18,187 gross (14,815 net) acres in in these two counties, and a total of 23,214 gross (17,316 net) acres that are presently prospective for the Utica Shale..
EOG Resources (EOG) is currently drilling for oil in the Permian Basin, Midland Basin, and the Wolfcamp Shale. In the West Texas Permian Basin, EOG increased drilling activity in the Wolfcamp formation during the second half of 2011 in preparation for a more active year in 2012. EOG reported success from the upper Wolfcamp zone. The University 9 #2803H in Reagan County, 25 miles west of its current middle Wolfcamp activity began production at 883 Bopd with 68 Bpd of NGLs and 388 Mcfd of natural gas. EOG has a 100 percent working interest in the well. In Irion County, the University 43 #0902H and 40A #0402H were completed in the middle Wolfcamp zone at initial oil rates of 1,088 and 1,076 Bopd, respectively. In addition to the strong oil production, the wells were turned to sales with 86 and 129 Bpd of NGLs and 489 and 736 Mcfd of natural gas, respectively. EOG has 90 and 85 percent working interest in the wells, respectively. On the border between Irion and Crockett counties, the University 40 #1309H and 38 #0601H began production at 1,738 and 1,077 Bopd with 137 and 119 Bpd of NGLs and 779 and 678 Mcfd of natural gas, respectively. EOG has 88 percent working interest in these wells. EOG plans to operate a four-rig drilling program in the Wolfcamp during 2012. In the West Texas Permian Basin, EOG increased drilling activity in the Wolfcamp formation during the second half of 2011 in preparation for a more active year in 2012. EOG reported success from the upper Wolfcamp zone. The University 9 #2803H in Reagan County, 25 miles west of its current middle Wolfcamp activity began production at 883 Bopd with 68 Bpd of NGLs and 388 Mcfd of natural gas. EOG has a 100 percent working interest in the well. In Irion County, the University 43 #0902H and 40A #0402H were completed in the middle Wolfcamp zone at initial oil rates of 1,088 and 1,076 Bopd, respectively. In addition to the strong oil production, the wells were turned to sales with 86 and 129 Bpd of NGLs and 489 and 736 Mcfd of natural gas, respectively. EOG has 90 and 85 percent working interest in the wells, respectively. On the border between Irion and Crockett counties, the University 40 #1309H and 38 #0601H began production at 1,738 and 1,077 Bopd with 137 and 119 Bpd of NGLs and 779 and 678 Mcfd of natural gas, respectively. EOG has 88 percent working interest in these wells. EOG plans to operate a four-rig drilling program in the Wolfcamp during 2012. In the New Mexico Leonard Shale, EOG reported drilling success from Lea County with the Caballo 23 Fed #4H and #6H. The wells, in which EOG has 86 percent working interest, initially produced at 932 and 750 Bopd with 116 and 99 Bpd of NGLs and 636 and 545 Mcfd of natural gas, respectively. 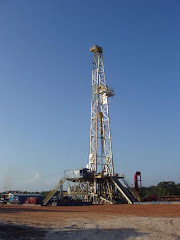 During 2012, EOG is positioned to increase its drilling activity in the Leonard Shale with a year-long two-rig program. EOG Resources (EOG) is out with their Barnett Shale Combo Play update. The Barnett Shale combo play is a zone of oil and natural gas. In the Fort Worth Barnett Shale Combo, EOG's second largest driver of liquids growth during 2011, total liquids production increased 107 percent compared to 2010, driven by a 124 percent increase in crude oil and condensate production. In Montague County, a pattern of five horizontal wells, the Badger A Unit #1H, B Unit #2H, C Unit #3H, D Unit #4H and E Unit #5H showed initial peak oil production rates ranging from 525 to 659 Bopd with 106 to 205 Bpd of NGLs and 704 to 1,361 Mcfd (thousand cubic feet per day) of natural gas per well. EOG has 100 percent working interest in the wells, which had an average peak crude oil production rate of 604 Bopd per well. A series of 10 McKown wells drilled in Cooke County, began producing to sales at an average oil rate of 689 Bopd, with 210 Bpd of NGLs and 1.4 MMcfd of natural gas per well. EOG has 93 percent working interest in these wells. During 2011, EOG expanded its core holdings in the Barnett Combo by approximately 25,000 acres to 200,000 net acres. Following the success of its drilling program last year, EOG expects the Barnett Combo to be its second largest liquids production growth contributor again in 2012. EOG Resources (EOG) recently gave a drilling update in the Bakken Shale. Consistent with its game plan to increase recovery rates in existing fields, during 2011 EOG continued infill drilling on its core acreage in the North Dakota Bakken Parshall Field, which it discovered in 2006. Although originally developed on 640-acre spacing, EOG has successfully tested 320-acre down-spacing in various areas and around the perimeters of the field. A recent well in Mountrail County, the Fertile 48-0905H, in which EOG has a 96 percent working interest, was completed at an initial rate of 1,324 Bopd. Also in Mountrail County, the Liberty 24-2531H and Liberty LR 20-26H were drilled on 320-acre spacing. The wells, in which EOG has 82 and 95 percent working interest, respectively, were turned to sales at initial crude oil rates of 1,507 and 1,165 Bopd, respectively. Over the course of 2012, EOG will continue its efforts to increase recovery of the oil-in-place on its Bakken acreage through further down-spacing tests and the initiation of a secondary recovery pilot project. FeedBurner FeedCount - Subscribe Below to My Blog Free Today!